I'd like to do something with my windows on OS X, where something includes options like re-arranging, moving, re-sizing, remembering positions, cloning across Spaces, etc. What options exist? Include short description about what this Window Managing app does. What makes this Window Manager app different than the others? Is it focused on re-sizing using only the keyboard? Is it focused on moving using only mouse gestures? Move & zoom to: full screen, left, right, top, bottom, top-left, top-right, bottom-right, bottom-left. Move & zoom to grid with customisable cells. Snap to edges and corners (move & zoom when dragging a window to a display edge or corner). Actions: move, zoom, grow, shrink, center, revert, move to other display. Configurable keys: ↑ → ↓ ← (with optional modifiers ⌘ ⌥ ⌃ ), Return, Space, Tab, Esc. 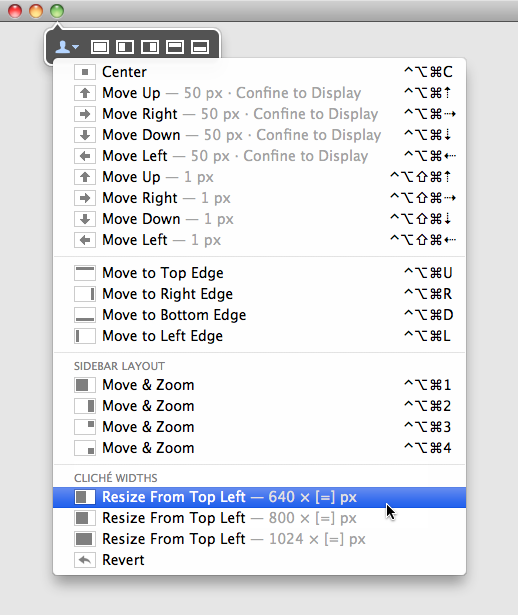 Actions: move, zoom, center, resize, grow, shrink, revert, arrange, move to other display. Save and restore window layouts. Hot keys can trigger a chain of multiple actions in sequence (eg: center followed by resize). BetterTouchTool is known for bringing more functionality to multi-touch trackpads and mice. It also allows you to to snap to the right/left sides, and all four corners. I would highly recommend this application. Provides keyboard shortcuts for arranging windows into the four quadrants of the screen, or filling any of the four halves (top, bottom, left, right), or centering a window. Slate is a relatively new option that's meant to replace all the previous window management tools. To use it you create a ~/.slate file, like a bashrc for window management. This gives you tons of options so you can make it work however you'd like. As some people have commented slate has seemingly been abandoned with a year since the last commit. Luckily I discovered Phoenix which is very similar to slate with similar configs. Provides a grid window you can use to select (via mouse) the size+location of your window. Has a finer grained selection dialog, and you can add keyboard shortcuts for preset sizes/locations. 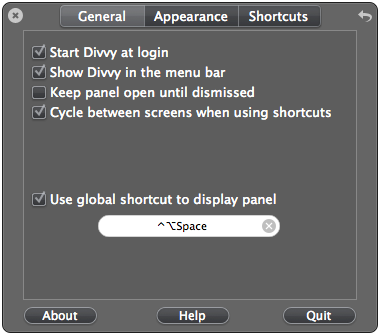 Activates via an icon in the menu bar, or by a configured global shortcut. 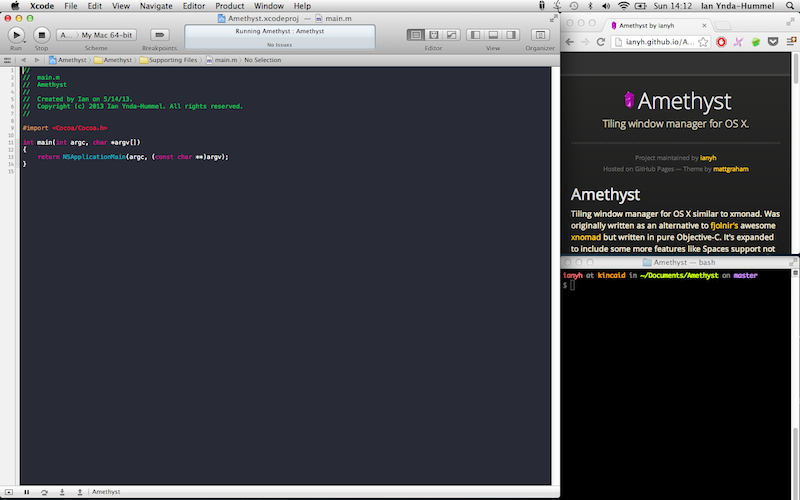 Tiling window manager for OS X similar to xmonad. Was originally written as an alternative to fjolnir’s awesome xnomad but written in pure Objective-C. It’s expanded to include some more features like Spaces support not reliant on fragile private APIs. BetterSnapTool allows you to easily manage your window positions and sizes by either dragging them to one of your screens corners or to the top, left or right side of your screen. 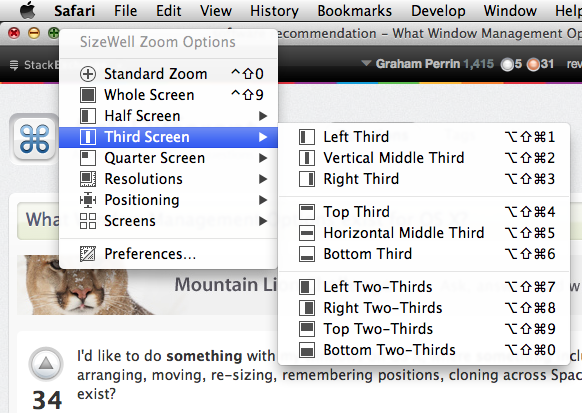 This lets you easily maximize your windows, position them side by side or even resize them to quarters of the screen. In addition to that you can set custom keyboard shortcuts in order to move and resize your windows the way you want. Because there are so many positions available, BetterSnapTool can also popup a menu from which you can select the one position you want. The app automatically puts a shade over all windows except for the currently focused one. 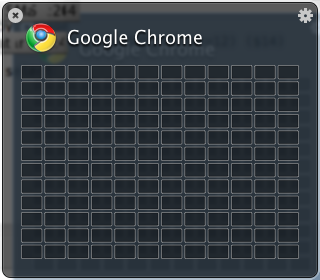 The distinct idea is that with this app you don't have to manage the windows per se. No need to organize, minimize or hide windows. You focus on the window you're working with and stop caring about the rest. Keep windows afloat (heh) on top of all others. Move windows from anywhere, not just the title bar. 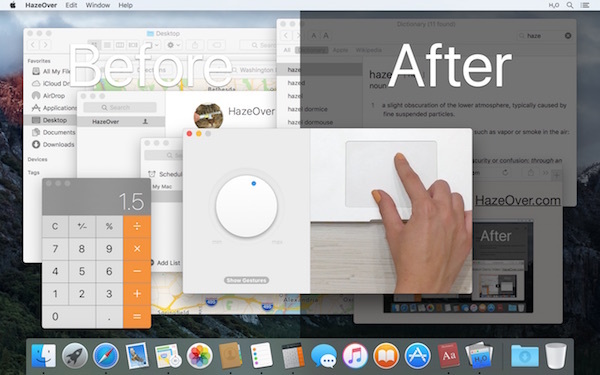 Turn a window into an "overlay" on your screen that doesn't hinder your work. Show a window's file in the Finder with nothing more than your keyboard. Resize windows from anywhere, not just the corner (new! ), and more. Move and resize windows by moving the mouse anywhere over the window. I hold down fn+⇧ to move and fn+ctrl to resize. Magnetism. If you like snapping windows the the edges of the screen or other windows (as in many X window managers), you will love this. 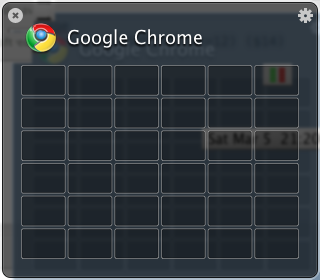 Snap to a grid to line windows up (similar to Divvy). Show information overlay, so you can precisely set the dimensions if you need to. A great application for bringing Windows 7 functionality to Mac OS X. It allows you to drag a window to the top, right, or left and it will resize for you. Then, when you grab the window again, the window resizes itself to its original size. This one is a simplified mash-up of Cinch and ShiftIt, bringing Windows 7 style docking along with a few helpful keyboard shortcuts. I'm going to stick with SizeUp for its Spaces and multiple monitor support, but this is a good, cheap option. Mouse only or mouse and keyboard. Drag a window to the part of the screen you want the window to fill, hit an arrow key and it snaps the window to where you want it to be. For example, if you already have a window that fills up 2/3 of the screen to the left, drag another window to the right 1/3 of the screen, hit an arrow key and it fills up that area with your other window. Stay automagically restores windows to a second monitor when it is connected. You need to set them up on the monitor and tell Stay to memorize the location before unplugging from the monitor. Lists all your open app windows with a preview. Type to search the list. Also searches your open tab titles from Safari, Google Chrome and Terminal. Mouse positioning with a grid and buttons. Create new positions and save them to the menubar. 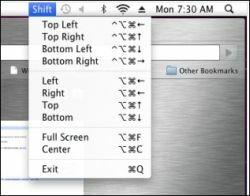 Keyboard shortcuts to position windows, move them freely around the screen and snap them to the screen edges. Good idea. Haven't heard about most of the others. Rearranges and resizes windows both with keyboard shortcuts, by selecting a predefined (grid-based) or freeform position/arrangement from an overlay hud-style window with the mouse, or by moving the window to active zones on the screen edges. 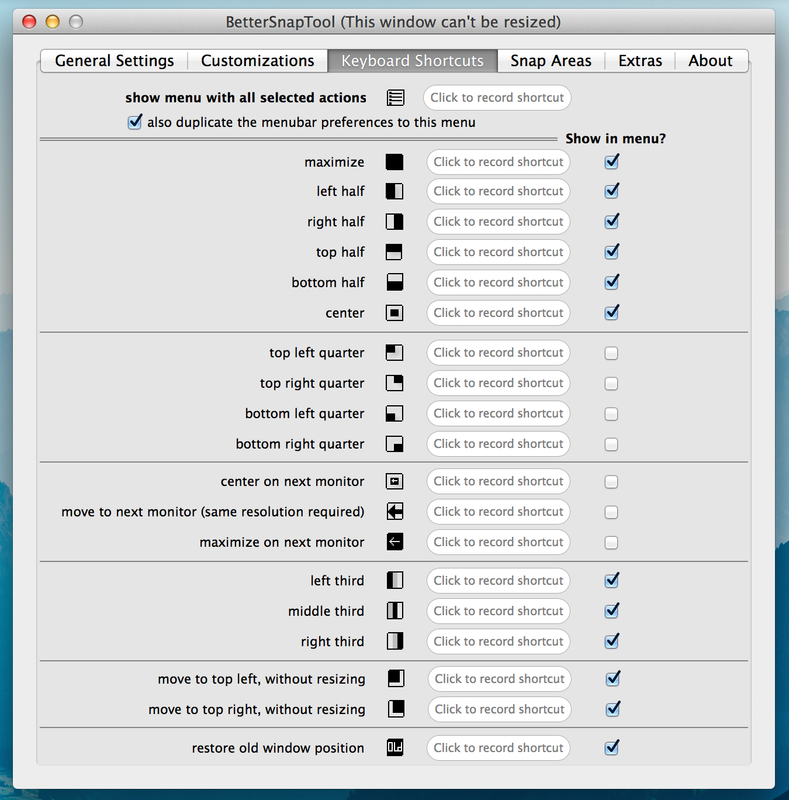 Each option supports multiple monitor configuration. The feature set of this newcomer includes a mouse-driven window mover and resizer. I use ctrl+←+Mouse movement for moving windows, ctrl+←+⌘+Mouse movement for resize. Fast on my MacBook 2,1. Download the trial from their site, rather than buying blindly from the App Store - well, that's common sense for any app. The other main modules are a quite simple launcher and a shortcut manager, which are also sold separately. Nulana promises to refine them soon. Nice: the launcher offers dictionary entries (copy function promised) and an automatic calculator with fractions. It's cheap, lightweight, does the job (left half, right half, full screen, restore original window size). I just found this searching for Alfred plugins. Layouts is an AppleScript file and an Alfred Workflow to give you a lightweight window manager for your Mac. Out of the box, it allows you to resize your active window to top half, right half, bottom half, left half, top left quarter, top right quarter, bottom right quarter, bottom left quarter, center window and zoom (full screen). One of my favorite window managers (albeit for X11) is Window Maker. In every way possible, it reproduces the elegant look and feel of the NEXTSTEP user interface. You can download the Window Maker source code, but it is also available on MacPorts if you'd like to use package management. 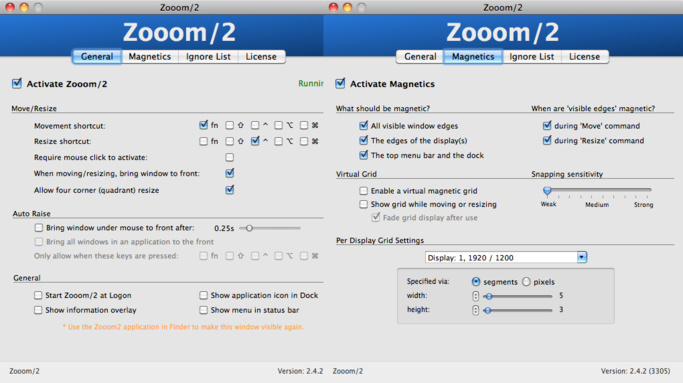 MacPorts is a robust, stable, mature and easy to use package management solution, for OS X. 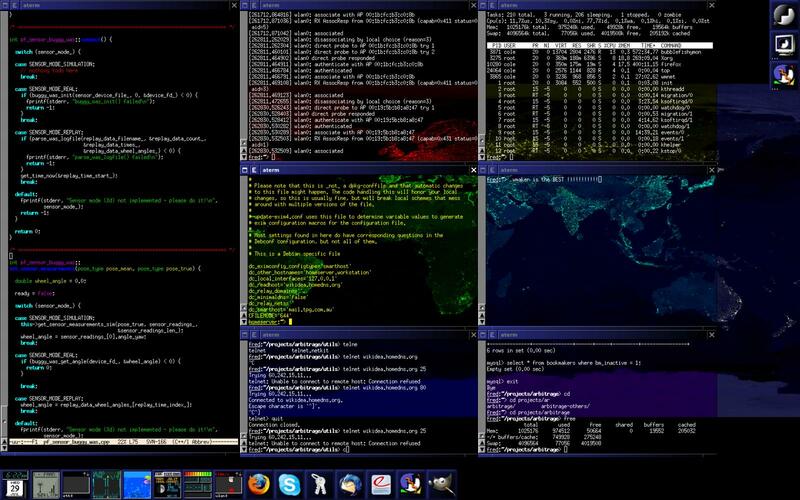 It is modeled after FreeBSD's ports system, which has been adopted as the basis of NetBSD's pkgsrc. Flexiglass features complete and convenient window management with exclusive multi-touch gestures support, offering a simple way to manage many windows on a Mac with a mouse, keyboard, trackpad, and graphics tablet. It includes different tools to move, resize, and arrange windows on the screen easily and joyfully. Usually, when you want to move or resize a window on a Mac you are limited by its title bar or lower-right corner. Flexiglass adds a Linux style Alt-Dragging to manage windows. 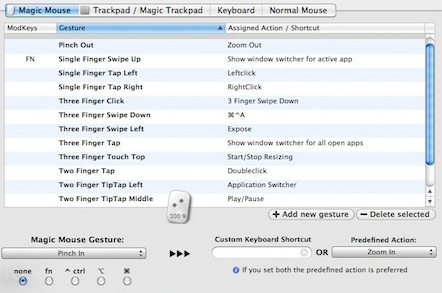 You can use finger gestures on your MacBook trackpad or Magic trackpad to move and resize windows. Flexiglass can save different settings for a trackpad and mouse and automatically change them when you plug or unplug devices. Quick Layouts is an intuitive snap feature. It is a simple solution for working with multiple windows which can be resized to take up halves or quarters of the screen or full screen. User-defined shortcuts allow you to move windows to halves or quarters of the screen and back to original size. These options make title bar buttons much more useful. Right-clicking on the green Zoom button will truly maximize a window to full screen. Right-clicking on the Close window button will quit the application. Double-clicking on the window title bar is the easiest way to expand it to full screen. Better window Manager allows you to position and size windows where you like them, then save it's state and associate it with a keyboard shortcut so you can restore that window state any time. 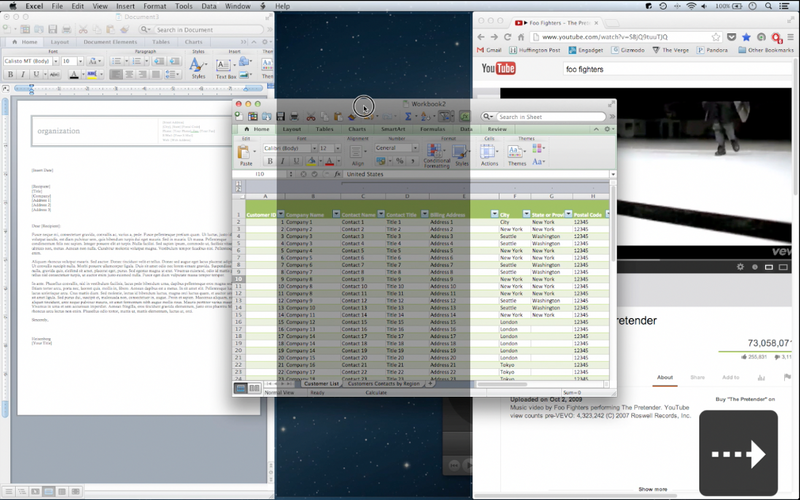 attaching positions: half left, half right, half top, half bottom, and 4 quarters of the screen. managing the windows on your computer has become a snap! With the iSnap app, you can organize various windows to fit perfectly on your screen and access them simultaneously! by clicking and dragging your windows to various sections on your screen, you can optimize productivity with a snap. 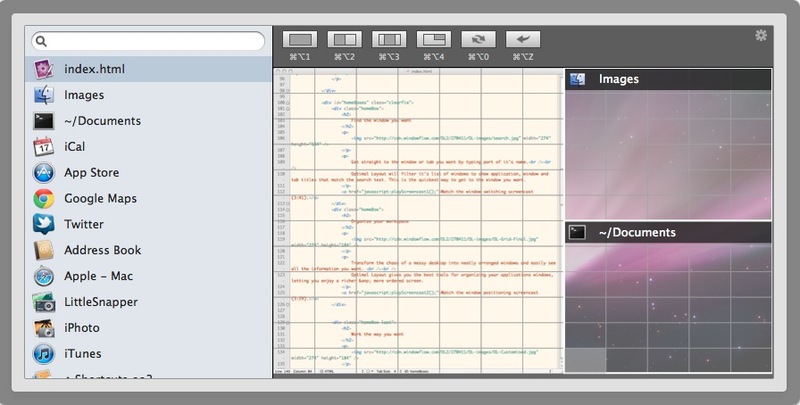 iSnap offers you 3 different templates to choose for optimal productivity. FastScripts adds functionality to other window managers such as SizeUp, including a script for tiling all open windows. Scripts can be run by binding to keyboard shortcuts. Can I get windows 7 like window resizing on Mac OS X? How do I maximize a window vertically? Is there a way to auto-resize programs like in Windows 7 and up? How to arrange two windows easily to left and right side? How do I move a window whose title bar is off-screen? Is there a keyboard shortcut to move a window from one monitor to another? How to move a window to another space without using the mouse? Window management app on mac os x? What options exist for ad free web browsing on iOS? What programs exist to find and delete “orphan files” left after deleting an Application?